Vevo wants to become the Lunchables for music videos, more or less. "Music videos are snackable. Bite-sized. That's why they're so popular," said Vevo's svp of national sales, Adam Smith. Vevo, which has seen year-over-year growth, is trying to really personalize the ad experience for its users. This includes recommending videos based on your viewing history, in addition to providing original content and exploring how to best use the Vevo app and other platforms. 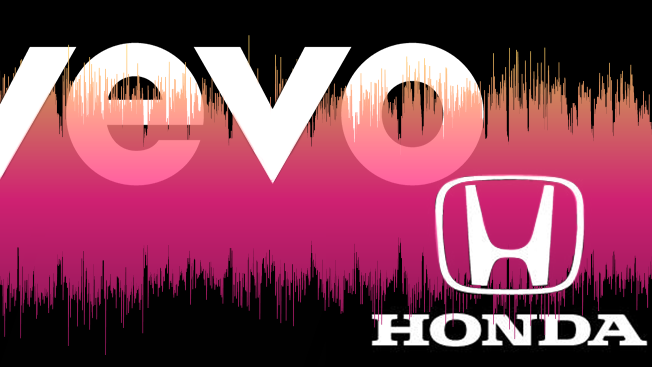 A huge brand partnership that Vevo has enjoyed is Honda, potentially an unlikely partner at first glance. But when you think about it, you always need some cool tunes for a road trip. "Vevo's platform allows us to reach the core of engaged music fans and also younger car buyers," said Phil Hruska, the manager of media strategy with American Honda. Honda Stage, the combination of digital content, music festivals and the Honda Civic Tour, launched in 2014 with Vevo as one of its founding members. "We can get the biggest names in music to perform on our Honda Civic Tour and then distribute that content on Vevo and target it to fans of that artist," said Hruska. "Neither original nor branded content should live in a vacuum," said Smith. "Our branded content lives adjacent to our entire library of content. We can deliver a mass reach to a specific audience, not many digital platforms have achieved that as well." It almost sounds like Vevo could replace one of the top five TV networks with its size and reach when you consider it earns 25 million unique visitors a day during its peak time each week, according to Smith. "Advertisers are familiar with the language of linear TV," he said. "This won't replace it, but it's a strong opportunity for advertisers to engage additional consumers." "Obviously millennials favor the digital space," said Hruska. "This works in tandem with, and acts as a nice complement to, the usual TV audiences. We want to continue to reach out to them by following that trend." "We want to help create compelling advertising programs that enhance without disrupting," said Smith. "They should open doors to new experiences." The way Smith sees it, it's a win-win scenario for Vevo's loyal consumers and brand partners like Honda: "The consumer gets new content, and the brand gets to be the conduit."